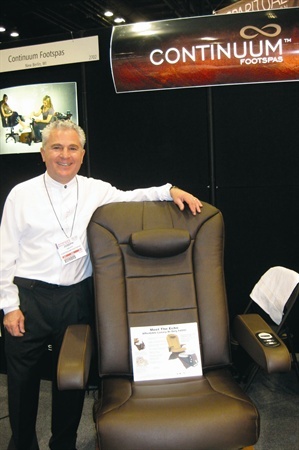 Over the years, we successfully designed, patented and manufactured thousands of pedicure spas. We’ve introduced ideas and designs that are still being emulated today. We are innovators, not duplicators and our innovations are legendary. Our devotion to manufacturing the highest quality pedicure spas ensures consistent improvement. And if the past is any indication of the future, you will be exceptionally pleased with the Continuum experience. Our message is simple: In an industry mired in sameness, we promise our leadership and experience will lead Continuum Footspas to be totally different and totally committed to superior design, quality and customer service. The company's Pedicute portable pedicure is shown in the photo to the right.